The Trump Administration makes another pitch for scaled-back research funding across agencies and disciplines. What follows is a high-level review of R&D spending in President Trump’s FY 2020 budget proposal. More detailed recaps will be posted separately, and see also the FY 2020 science appropriations dashboard. Any review of a president’s budget must start with big-picture discretionary spending proposals. Discretionary spending is the part of the budget allocated annually through the appropriations process and, as the home of virtually every R&D program, is incredibly important context for science funding. As previously reported, under current law, the discretionary caps—which have been in place since 2011—are scheduled to sharply drop by 10 percent or $125 billion on October 1, the start of the 2020 fiscal year. The cap on defense spending—which covers the Department of Defense, the National Nuclear Security Administration, and a few other programs in other departments—will drop by 11 percent or $71 billion. The nondefense cap—covering everything else, including NASA, NIH, the National Science Foundation, and others—will drop by 9 percent or $54 billion. Federal programs have been threatened with such drops before, but Congress has repeatedly found ways to avert such cuts (for example). 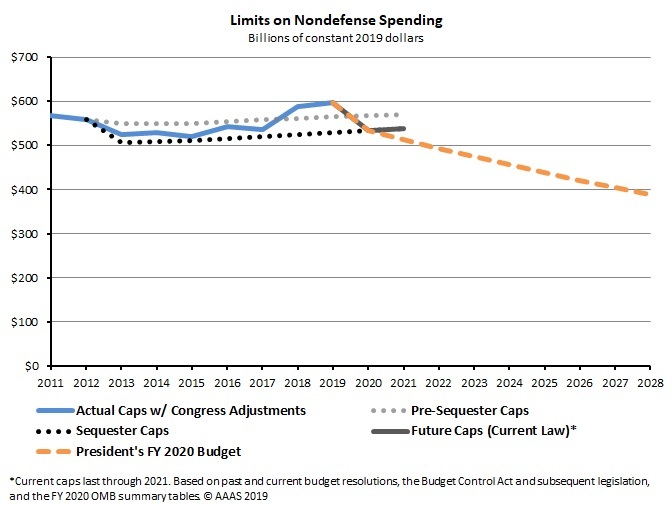 In their FY 2020 budget, the Trump Administration would allow the nondefense spending drop to take place as currently required, while slowing spending growth by $1.1 trillion in future years (see graph above). The defense side would be shielded with an additional $174 billion in controversial war and other emergency funding, which is not subject to the caps. As a result of this end-run around the defense cap, total defense spending would rise by 4.7 percent or $34 billion above FY 2019 levels to $750 billion total–30 percent above current law–while nondefense spending would drop by 9.0 percent or $54 billion (see table below). The nondefense adjustment opens up the door to year-over-year funding cuts that should be familiar from prior Trump Administration budgets, as reported previously: a particular focus on cutting energy technology programs, including the elimination of ARPA-E; sizable reductions to environmental research programs at EPA and the U.S. Geological Survey, and elimination of the Sea Grant program within the National Oceanic and Atmospheric Administration; and a renewed willingness to reduce funding for even basic science agencies like the National Institutes of Health which have an extended track record of federal funding support. AAAS estimates based on White House Office of Management and Budget (OMB) and agency data are in the table at right (click here to see an expanded table with estimates by agency). 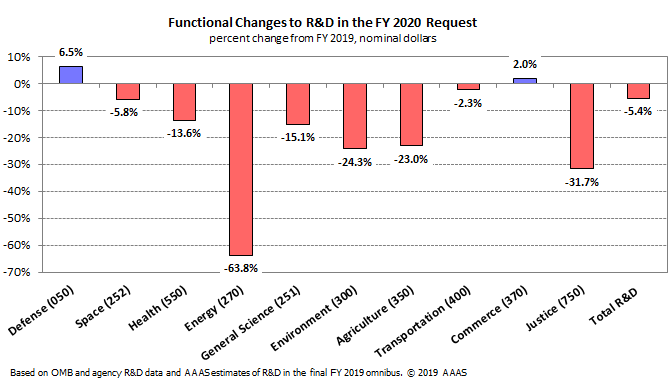 Echoing past budgets, the FY 2020 request takes particular aim at nondefense R&D with a 16.0 percent or $12.7 billion reduction below FY 2019. This primarily represents cuts to basic and applied research, which are dominant in the nondefense budget. While the FY 2020 request would boost defense R&D, this increase would be mostly devoted to development activities. Even with a 3.8 percent increase in DARPA funding, overall Defense research spending would decline by 20.4 percent. Coupled with the nondefense agency reductions, government-wide basic and applied research expenditures in FY 2020 would decline by $12.2 billion or 14.4 percent, per current AAAS estimates. A note of caution when interpreting these figures: for certain agencies with exceedingly late final appropriations, the Administration’s budget preparers simply assumed continuing resolution (CR)-level funding in FY 2019 (i.e. mostly flat) and used that assumption to generate R&D estimates. This is a perfectly reasonable step given the circumstances. 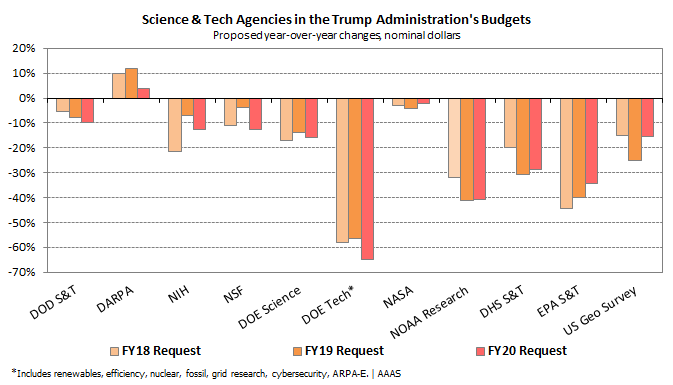 However, it means that the official White House R&D figures missed the increases appropriated to the National Science Foundation (NSF), USDA, and certain other large funders in the final omnibus in February. 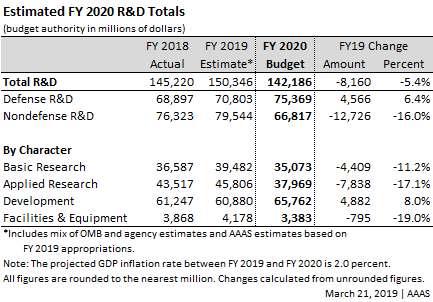 In an attempt to best reflect the current state of affairs, the estimates presented in this summary (and elsewhere on this site) generally swap out these CR-based figures for AAAS-generated estimates of R&D by agency and account from the final FY 2019 omnibus, where necessary. The figures in this summary are up to date as of March 21, 2019. In addition, in cases where OMB- and agency-sourced data differed, AAAS generally defaulted to the agency numbers. All figures continue to rely on the recently-revised definition of “development,” which is an appropriate improvement but has the effect of reducing the nominal size of the total R&D budget relative to historical practice. The graph below depicts proposed changes to R&D by budget function, with account codes displayed; click here to download the underlying data. As mentioned above, the White House budget is particularly focused on cutting back energy R&D while favoring Defense development activities. The increase in Commerce R&D is mainly due to the Administration’s request of $288 million to renovate National Institute of Standards and Technology (NIST) facilities in Colorado. This would be financed via a Federal Capital Revolving Fund, a newly-proposed method of budgeting for capital projects, and is in addition to other facilities funding requested for NIST. Amid the breadth of funding reductions, the White House has touted a few priorities. These and others are spotlighted below. AI. The White House reports an $850 million investment in R&D on artificial intelligence in FY 2020 among civilian agencies, divided across the Department of Energy, NIH, NIST, and the National Science Foundation, in addition to $927 million for AI research from the Pentagon. This puts a little more meat on the White House’s American AI Initiative, the subject of an executive order in February. NSF’s budget request indicates a $492 million investment in AI, with roughly two-thirds funded through NSF’s Computer and Information Science and Engineering (CISE) directorate, and most of the rest from the Engineering directorate. This represents increases on the order of 8-10 percent above FY 2018 levels, but no figures are yet available for FY 2019 given the recency of appropriations. On the defense side, the Pentagon is requesting a large plus-up for the Joint Artificial Intelligence Center, and DARPA would ramp up multiple projects and establish a new thrust area in fundamental AI science. Quantum Information Science. Building on prior efforts, the White House is seeking $430 million for their quantum science initiative. This includes $168.5 million for the Office of Science, a $63.5 million increase from last year’s requested level. NSF would devote $106 million to the initiative per its request, with about half funded via the Mathematical and Physical Sciences directorate. Lunar Exploration. The Administration continues to prioritize funding for lunar activities at NASA. The core Lunar Gateway budget would grow from $450 million in FY 2019 to $821 million in FY 2020. The Advanced Cislunar and Surface Capabilities account, which funds robotic lunar missions to the surface of the moon, would more than triple from last year’s appropriation to $363 million total. The budget would also establish a new Lunar Surface Innovation Initiative to spur creation of novel technologies for exploration. Elsewhere in the space realm, DOD is requesting $150 million for the Space Development Agency, a new component tasked with developing next-generation space technology, in addition to $72.4 million for the Space Force. Competitive Agricultural Research and Infrastructure. While certain other USDA research programs would be trimmed or relocated, the competitive Agriculture and Food Research Initiative (AFRI) would receive $500 million, a 20.5 percent boost from FY 2019 appropriations. The budget also establishes a competitive $50 million program aimed at facility modernization at land-grant universities. Exascale Computing. The Department of Energy’s exascale budget would rise to $809 million, including $500 million for the Office of Science and $309 million for National Nuclear Security Administration activities. Both figures represent a rough doubling from FY 2019 appropriations. Cybersecurity. The budget requests $17.4 billion in unclassified cybersecurity funding (not all R&D), with more than half funded through DOD. R&D components include $37 million for the Department of Homeland Security—mostly funded via the new Cybersecurity and Infrastructure Security Agency—and $36 million for the Energy Department’s new cybersecurity office.